Eleanor Mason, nee Jasper, 1875-1938. 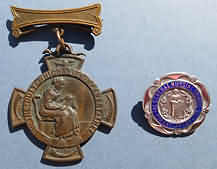 This amazing set of badges were sold recently, and include both a Queen’s South Africa Medal, and Kings South Africa, to the same nurse, along with a Princess Christian nurses’ numbered cape badge, her GNC badge; in her married name, and her training school badge, and an ARRC, with accompanying letter, which confirms that Eleanor was the recipient. and GNC badge. 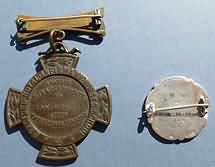 Right: The reverse side of her badges. Above Left: Eleanor's ARRC, and (Rt) accompanying letter. The Leeds War Memorial – Whose names Should be Put on the Tablet. 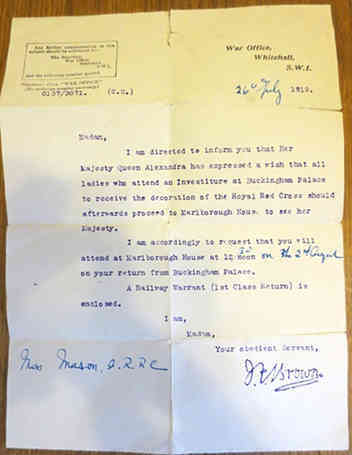 The request of the Lord Mayor of Leeds, (Alderman A.E. 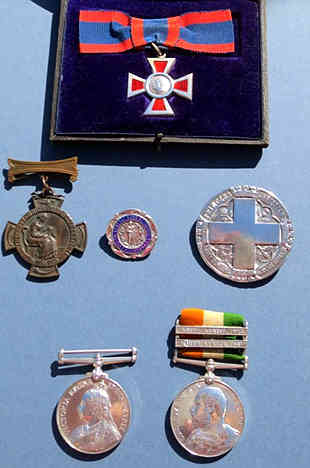 Butler) for the names of Leeds men who have served in South the South African campaign has brought communications from about a hundred soldiers in the regular and militia regiments. 1. Ancestry.co.uk; http://www.freebmd.org.uk/cgi/search.pl; Census Returns of England 1881, The National Archives of the UK, Kew, Surrey, England. 3. Ancestry.co.uk, Census Returns of England 1891, The National Archives of the UK , Kew, Surrey, England. 4. West Yorkshire Archive Service, Bradford Royal Infirmary, Board of Management minute book, 1890 – 1900, ref. C501/2/7, p 248. 5. http://www.boerwarnurses.com, accessed 30th August 2014. 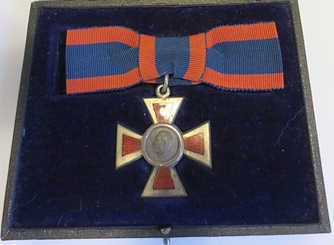 6. https://www.forces-war-records.co.uk/medals/queens-south-africa-medal, accessed 30th August 2014. 8. http://rcnarchive.rcn.org.uk, The British Journal of Nursing, Feb. 26, 1910, p 171, and The BNJ March 12th 1910, p210, accessed 30th August 2014. 9. http://rcnarchive.rcn.org.uk, The British Journal of Nursing, Feb. 26, 1910, p 171, accessed 30th August 2014. 10. http://rcnarchive.rcn.org.uk, The BNJ March 12th 1910, p210, accessed 30th August 2014. 11. http://rcnarchive.rcn.org.uk, The BNJ May 6th 1911, p 350, accessed 30th August 2014. 12. www.cwgc.org, accessed 30th August 2014. 13. http://www.yorkshireindexers.info/wiki/index,LeedsTownHallBoerWarMemorial, accessed 9th September 2014. 14. http://www.yorkshireindexers.info/wiki/index,LeedsTownHallBoerWarMemorial, accessed 9th September 2014. 15. http://www.102ndbattalioncef.ca/warpages/102CHAP12.htm, accessed 9th September 2014. 16. www.ancestry.com, accessed 13th May 2014. 18. www.findmypast.co.uk, accessed 9th September 2014. 18. www..ancestry.com, accessed 13th May 2014; Certified copy of a marriage 2nd February 1918. 19.www.britishnewspaperlibrary, The Daily Mail, Monday February 4th 1918, accessed 14th May 2014. 21. Will of Eleanor Mason., proved 1st October 1938. 22. Will of Eleanor Mason. 23. Certified Copy of a death Certificate of Eleanor Mason. 34. www.ancestry.com, US City Directories, accessed 11th May 2014. 25. www.ancestry.com, accessed 11th May 2014. Many thanks to the staff in Wakefield Archives and the RCN Archives, Suzanne, and Will - webmaster@schoolsofnursing.co.uk.